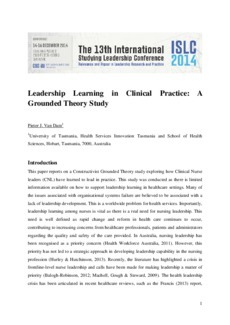 This paper reports on a Constructivist Grounded Theory study exploring how Clinical Nurse leaders (CNL) have learned to lead in practice. This study was conducted as there is limited information available on how to support leadership learning in healthcare settings. Many of the issues associated with organisational systems failure are believed to be associated with a lack of leadership development. This is a worldwide problem for health services. Importantly, leadership learning among nurses is vital as there is a real need for nursing leadership. This need is well defined as rapid change and reform in health care continues to occur, contributing to increasing concerns from healthcare professionals, patients and administrators regarding the quality and safety of the care provided. In Australia, nursing leadership has been recognised as a priority concern (Health Workforce Australia, 2011). However, this priority has not led to a strategic approach in developing leadership capability in the nursing profession (Hurley & Hutchinson, 2013). Recently, the literature has highlighted a crisis in frontline-level nurse leadership and calls have been made for making leadership a matter of priority (Balogh-Robinson, 2012; Machell, Gough & Steward, 2009). The health leadership crisis has been articulated in recent healthcare reviews, such as the Francis (2013) report, showing failures by medical and nursing staff to deliver safe care, resulting in poor patient outcomes. Within healthcare most learning occurs through practice and the essential aspects of the professional healthcare role are learned within the work environment. This may also apply to learning to lead in health. However, how this social process exactly takes places is not entirely clear. Little is known about leadership learning processes in clinical practice and few studies have been conducted in this area. It is therefore important to expose the processes of leadership learning (Kempster, 2009 a). It has been argued that he starting point of leadership development entails social learning, as nurses within their work milieu explore ways of solving issues they encounter while they practice nursing (Copland, 2003; Sharlow, Langenhoff, Bhatti, Spiers, & Cummings, 2009).